Your eyes play a significant role in your health and there are many steps you should be taking to ensure they are protected at all times. Some types of eye problems affect one in six adults over the age of 45. And as you age, so does your risk of vision loss. It is estimated that 43 million Americans will develop an age-related eye disease by the year 2020. Eat your carrots and wear sunglasses, is this all you need to do to protect your vision? If you haven’t had an eye exam lately, that is critical for good eye health. Many eye problems, including glaucoma, progress slowly and often go unnoticed until the disease has progressed. You might also want to change some habits that could be negatively affecting your eye health. 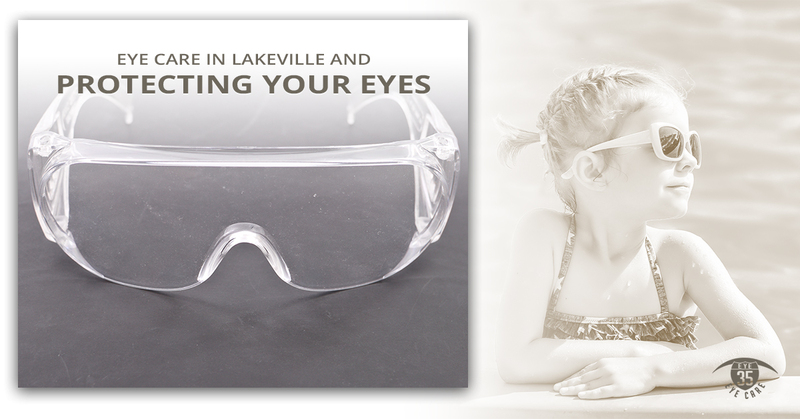 Eye 35 Eye Care, your eye care center in Lakeville, offers ways in which you can protect your eye health. This is an obvious one. You protect your skin from ultraviolet radiation by using sunscreen and your eyes need similar protection. The best way to protect your eyes from the damaging sun rays is by wearing sunglasses with protection from UVA and UVB rays. There are many inexpensive brands that offer this level of protection so you have a variety of choices. It’s not just carrots that affect how well you see. There are plenty of foods rich in nutrients that improve your eyesight and help prevent the development of certain vision problems. Foods that are high in vitamins C, E and zinc help with the symptoms of age-related macular degeneration. Dehydration can affect your eyes, so it is important to stay hydrated. Drinking plenty of water provides fluid for normal eye function. You know what a bummer it is when you get sand or dust in your eyes. You should be protecting your eyes from foreign bodies that can cause abrasions as best as possible. This means if you are playing football on the beach or throwing a Frisbee in the park, you should be wearing eye protection. It is also important that you wear safety goggles when you are doing yard work or woodworking. Always look to prevention first. Regular physical activity helps stave off cardiovascular disease and reduces your risk of diabetes, which are both risk factors for chronic eye disease. If you are overweight, the increased inflammation elevates the risk of arterial disease, high blood pressure and diabetes, which are all enemies of your eyes. If you stare at a computer monitor all day, we suggest you implement the 20/20/20 rule. For every 20 minutes that you spend staring at the computer screen, look at something else in front of you 20 feet away for 20 seconds. This helps reduce eye strain. A comprehensive eye exam can determine your risk for major eye diseases even if you show no symptoms. An exam will also determine whether or not your prescription eyeglasses or contact lenses are up to date. If it has been a while since your last eye exam, call Eye 35 Eye Care today.